Festival of Chichester 2018 programme unveiled! Festival committee, friends, supporters and performers gather. Pic by Jake Barlow. Friends, supporters and performers gathered at the Novium on Wednesday night to launch this year’s Festival of Chichester programme which goes live today (Thursday). Organisers are thrilled with the programme that has come together, four weeks of top-quality entertainment from June 16-July 15 which will celebrate the city of Chichester. Festival co-ordinator Barry Smith added: “Chichester is a special city and thoroughly deserves a special Festival. Our motto is that the festival is grounded in the community but aspires towards the stars. After five years of putting on what has become one of the largest and most vibrant arts festivals in the south, the challenge to go one better becomes tougher every year. But we think we’ve got something for everybody for the 2018 festival. “For lovers of classical music, we have two of the world’s most celebrated pianists, Stephen Kovacevich and Victor Ryabchikov, as well as a major orchestral concert from WSO and Kosmos Ensemble featuring Dvorak’s New World. Elsewhere, we have Pavlos Carvalho at St John’s Chapel and String Dimensions at St Pancras. For literature lovers we have a real treat with Captain Corelli’s Mandolin author Louis de Bernieres reading his poetry at the Poetry & Jazz Café. Mr Shipton added that very special thanks were due to the festival committee and its chairman Dr Phil Hewitt who established the festival and is the arts editor of this title. Saturday, June 16: All That Malarkey, St John’s Chapel; Chichester City Band, St Paul’s. Sunday, June 17, Little Vicky And The Seven Assassins, Isosceles, St John’s Chapel; Oberon’s Cure, The Rude Mechanical Theatre, Halnaker Park Cottage Garden. Tuesday, June 19, Solo Bach Cello Suites 1 And 2, Pavlos Carvalho, St John’s Chapel; The Parnassian Ensemble, St John’s Chapel; Hamlet, All The World’s A Space, The Chichester Inn. Wednesday, June 20: ‘Allo ‘Allo!, Chichester Players, Centenary Theatre, Chichester High School; A Spagna In The Works, St John’s Chapel. Thursday, June 21: Country Chronicles, David Johnston, New Park Community Centre; Tyger, Tyger: Deborah Rose & Mari Randle, Blakefest, St John’s Chapel. Sunday, June 24: Guitars In The Garden, West Dean Gardens Restaurant; Eduardo Niebla Experience, St John’s Chapel. Monday, June 25: The Rivals by Richard Brinsley Sheridan, New Theatre Productions, West Dean Gardens. Wednesday, June 27: Selling One’s Own Wares, Sandra Saer Of SMH Books, New Park Centre; Peter Rice And Friends, St Martin’s Organic Coffee House. Friday, June 29: Seascape Drawings and Paintings by Catherine Barnes, Festival Artists, Juno Studio, 107 Cedar Drive, Chichester; Louis De Bernières Lunchtime Talk, Vicars’ Hall; Opera Night, 60 Minutes Of Classical Music, The Regis Centre, Belmont Street, Bognor Regis; Phoenix Big Band, Assembly Room, North Street. 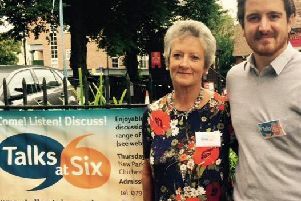 Saturday, June 30: Festival Artists, Merston Studio and St Giles Church, Marsh Lane, Merston; Family Concert – Chichester Chamber Concerts, Assembly Room; An Evening with Kate Mosse, Talks At Six, New Park Centre; Summer Charity Concert, Chichester Community Choir, St Paul’s; The Azure Main, Hampshire Recorder Sinfonia, St George’s Church; NMH with Consort Of Viols, Boxgrove Priory. Sunday, July 1, The Grand Tour, Consort Of Twelve, St Paul’s Church; Guided Tour of City Walls.